If you garden, know anyone who gardens or you visit farmers’ markets this summer, you will eventually need zucchini recipes. This is an easy make-ahead salad that is great served cold or at room temperature. Take it to your next community potluck or serve it the next time you invite friends over for a barbecue. It goes great as a side dish with grilled meat and you can pack leftovers for lunch. If you store the salad in the refrigerator, you may need to add a touch of olive oil to perk it up if it looks dry. This salad works well with zucchini or yellow squash or a combination of both. One serving gives about 25% of the Dietary Fiber you need in a day. Bring a large pot of salted water to a boil. Cook orzo as label directs. Drain, rinse with cold water and drain again. Set aside. Heat 2 Tbsp olive oil in a large skillet over medium-high heat. Add garlic and stir for about 30 seconds, then add zucchini and season with salt and pepper. Cook, stirring occasionally, until zucchini begins to brown, about 5 minutes. Remove from heat and cool to room temperature. 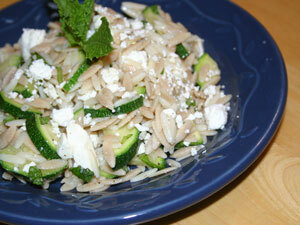 In a large bowl, combine orzo and zucchini. Stir in ¾ of the feta, ¾ of the mint and the remaining 1 Tbsp of olive oil. Season with salt and pepper. Top with remaining feta and mint. Looks awesome! I am such a fan of zuchini and of course any produce from the Farmers Market :).